Samsung's W-series phones are high-end handsets with a flip form factor. The melding of the old and new works out just fine for those who miss their old device, but want to have the most up to date software and specs. The SM-W2018 is expected to be the latest W-series handset coming from Samsung. Back in May, the phone was certified by China's regulatory TENAA agency. At the time, the handset was powered by the Snapdragon 821 chipset and carried 4GB of RAM inside. Earlier this month, the manual for the phone leaked revealing that wireless charging will be a feature on the phone. Today, a tweet sent out by a tipster out of China tells us to expect the SM-W2018 to carry specs that are even more high-end than originally thought. 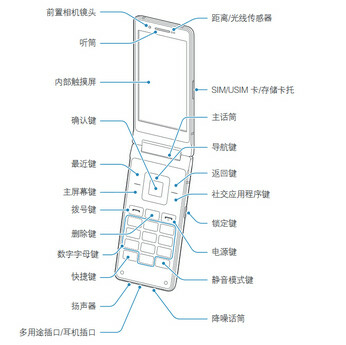 According to the tweets, the flip phone will be powered by the Snapdragon 835 chipset. That means we should expect an octa-core CPU and the Adreno 540 GPU. In addition, the phone will sport 6GB of RAM and 64GB of native storage according to this leak. The SM-W2018 features a pair of 4.2-inch screens, both with a 1080 x 1920 resolution. A 2300mAh battery keeps the lights on, and there is a 12MP camera in back with a 5MP selfie snapper in front. Our original information stated that Android 6.0.1 is pre-installed. If so, that might be related to the form factor. We will know more when the phone is unveiled, which should happen in the near future. So they put 6GB in this phone, but not in there flagship Galaxy S? I'm confused. The flipper will have a smaller display and certainly far less features. So why is it getting 6GB of RAM? 6GB would have been great on the S8's. Huge flop!!! Let's try to make 2005 hip again..
Because the US and the West will never see it locally for Sale. 6GB of RAM or not, they more importantly need to address the underlying real world performance issues causing s8/s8+ to lag/stutter. May as well put out as many as they can before they become banned...unless they can figure out a way to incorporate fingerprint and other biometric scanners into them. You realize that not only is the iPhone an older model (came out last September) but has sold over 15x more handsets than the S8 duo, right? The statistics have to account for these variables, as more users are ALWAYS going to create more problems. Same with the longer you hold onto a phone. Also, everything beyond the first paragraph in your post is wholly unnecessary. It's long, convoluted, copypasta that adds nothing to your original point. Someone could do the EXACT SAME search for the S8 and copypasta, what then? Just stay on topic. You are a well known Apple troll who just got triggered. And you're a nobody all over my joystick. You should be grateful... senpai finally noticed you :). Yet another high-end clamshell from Samsung. How do I get one at my local store? Can't seem to find any. This is good news for the rectangle slab haters. Bravo.